HAMILTON, BERMUDA --(Marketwired - October 10, 2013) - Mitsubishi UFJ Trust and Banking Corporation ('MUTB') is pleased to announce that its acquisition of Butterfield Fulcrum Group ('BFG') was completed on September 20, 2013. Established in 1927, MUTB is a wholly owned subsidiary of Mitsubishi UFJ Financial Group ('MUFG'), the 2nd largest global bank holding company ranked by assets. Butterfield Fulcrum will become the global alternative asset administration platform of MUTB. The senior management team, as well as all management and staff in all Butterfield Fulcrum offices will remain with the company. BFG has been rebranded as Mitsubishi UFJ Fund Services to reflect its new position in MUFG. "Our acquisition of BFG is a strategic move into the alternative fund administration business. We will be expanding our reach and breadth of services rapidly. Clients can look forward to the addition of numerous new services including banking, custody, trust, foreign exchange and securities lending," said Mr. Tasuo Wakabayashi, President of Mitsubishi UFJ Trust & Banking Corporation. "We will grow from strength to strength within the MUTB family. The additional services we will be offering will allow us to continue our focus on excellent client service, expanded functionality and cutting edge technology," said Glenn Henderson, now the CEO of Mitsubishi UFJ Fund Services. To celebrate the completion of the acquisition and the official rebranding a ceremony was held in Bermuda on October 9th with senior executives of both companies. East meets west: Tatsuo Wakabayashi, president of MUTB, cuts the ribbon to mark the acquisition and rebranding of Bermuda's BFG as Mitsubishi UFJ Fund Services. 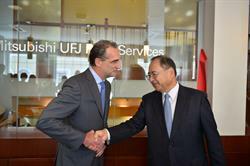 He is pictured with Glenn Henderson, now CEO of Mitsubishi UFJ Fund Services.